May is full of special days: mother's day, Mary's day, Marco's birthday! 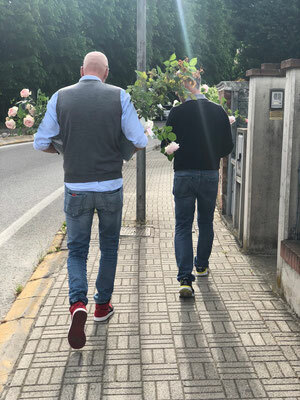 May is also special for roses. I can not say which my favourite season is, each period of the year is special, but for sure I immediately fall in love as soon as feel the first scent of spring in the air. The bright colours of Anemones and buttercups announce the season of rebirth but only the strong fragrance of lillac and rose takes me out of winter cold. 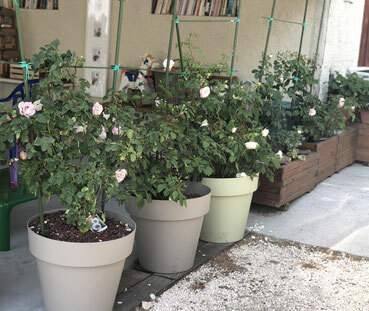 We planted some roots coming from David Austin garden last October and I was so surprised last December when I saw such strong and luxuriant plants grew up in the vases. 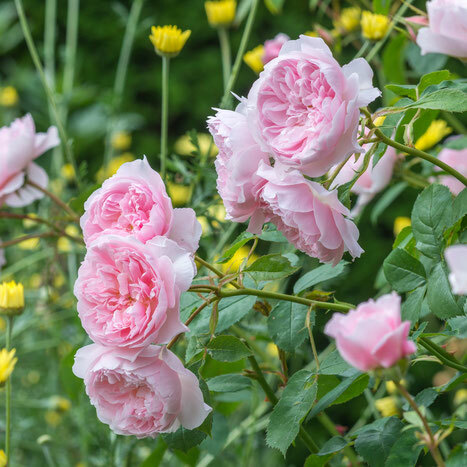 The first three varieties ("The Lady of the lake", "Claire Austin" and the "Generous Gardener" ) are now blossoming, the "Bobbie James" , the "Zephirine" and "Cinderella" show the first buds. It takes so much time and so much attention to feed, treat and sustain the growth of those gorgeous varieties but when the first harvest was composed in a bouquet I was so excited and proud about myself. Perfection is still far away but I'm learning, studying and improving day by day. 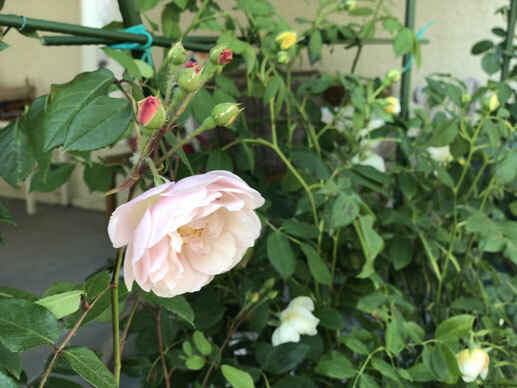 The excitement coming form this wonderful flowers is something that fills my heart.The most precious varieties are located in the big vases along the short side of hayloft so also the guest coming during the summer can enjoy flowers and their scent during the breakfast time. Some young plants (Bobbie James varieties) are along the long side of hen -house so the geese naturally pruned in march.I was so sad when I found the disaster but the roots are healthy and plants are growing up stronger the before. I hope their thorns protect branches for the future. The Cinderella guards the patio in the center of frontal garden and, for the moment, the young hens are not interested about her. 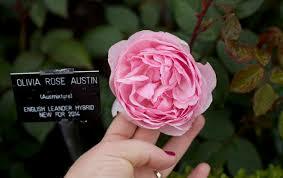 Claire is David Austin's doughter. She has a nursery which specializes in hardly plants, including the UK's finest collection of irises, peonies and day lilies. 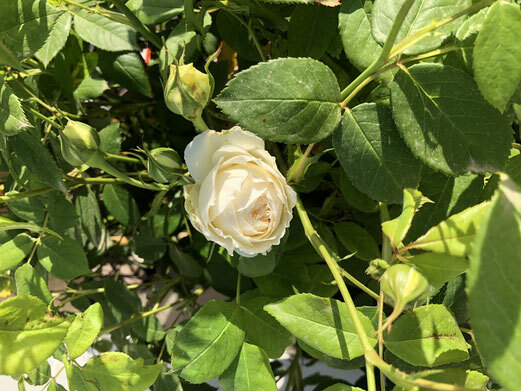 There is something a little special about white roses - they are all purity and light - and yet really good white roses are rare among English Roses and Hybrid Tea Roses alike. This is because white roses are very difficult to breed. 'Claire Austin' bears pleasingly cupped buds of a pale lemon shade which gradually open to form large, creamy white flowers of typical English Musk delicacy; their petals perfectly arranged in concentric circles, with a few more loosely arranged in the centre. They have a strong fragrance based on myrrh with dashes of meadowsweet, vanilla and heliotrope. Strong and particularly healthy. Undoubtedly one of our finest white roses to date. The Lady of the Lake is the name of the ruler of Avalon in the Arthurian legend. She also plays a pivotal role in Sir Walter Scott's famous poem of the same name. A very healthy rambler, which flowers freely and repeatedly throughout the summer. Its pretty, semi-double flowers, each about 2" across, are held in sprays on long, slender and flexible stems. They are a pale pink colour with golden stamens and a fresh citrus fragrance. DavidﾠAustin, 2014. Introduced by Unknown (Australia) in 1967 as 'Cinderella'.Disney's animated feature, Cinderella, premiered on February 15, 1950. A giant rambler, producing exceptionally large, heavy heads of strongly fragrant, white flowers. The individual blooms are small, semidouble and cupped, each with a central boss of yellow stamens. They are followed by large quantities of small, oval, orange-red hips. 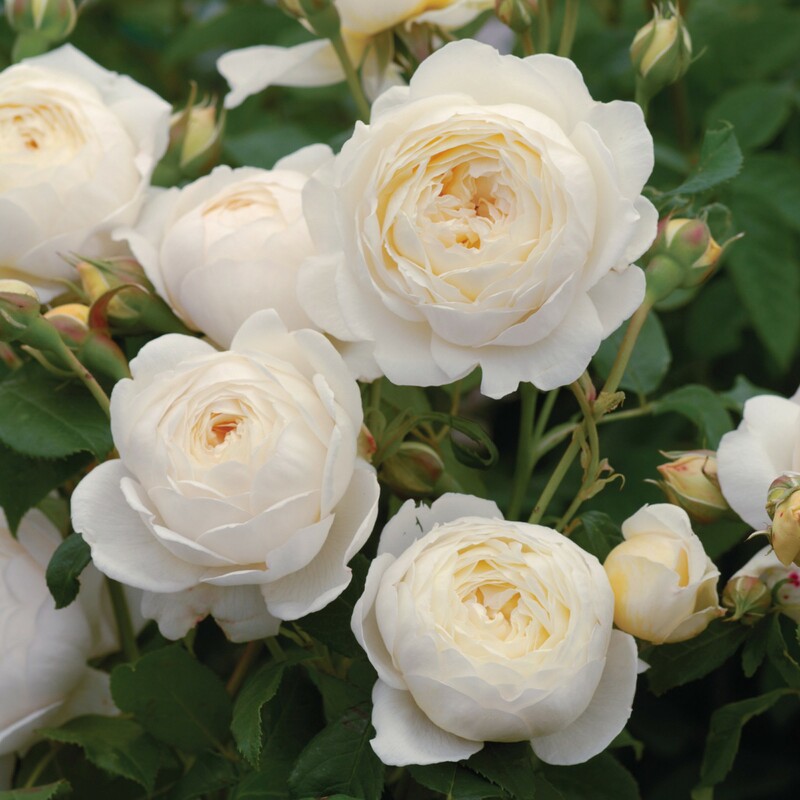 It is very healthy and vigorous, producing long, thick stems with glossy, pale green leaves.A giant rambler, producing exceptionally large, heavy heads of strongly fragrant, white flowers. The individual blooms are small, semidouble and cupped, each with a central boss of yellow stamens. They are followed by large quantities of small, oval, orange-red hips. 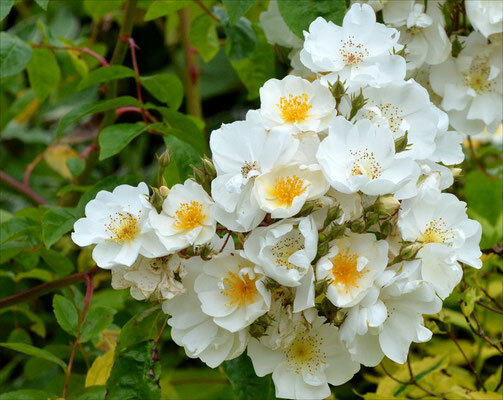 It is very healthy and vigorous, producing long, thick stems with glossy, pale green leaves. .
Named for the famous RHS Gardens at Wisley, where many English Roses are planted. 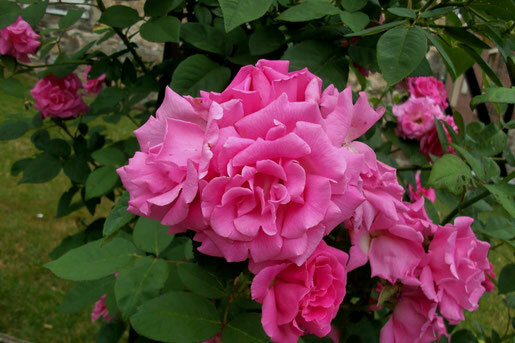 This variety should not be confused with a rose named ‘Wisley’ which, although beautiful, did not live up to our standards for health. 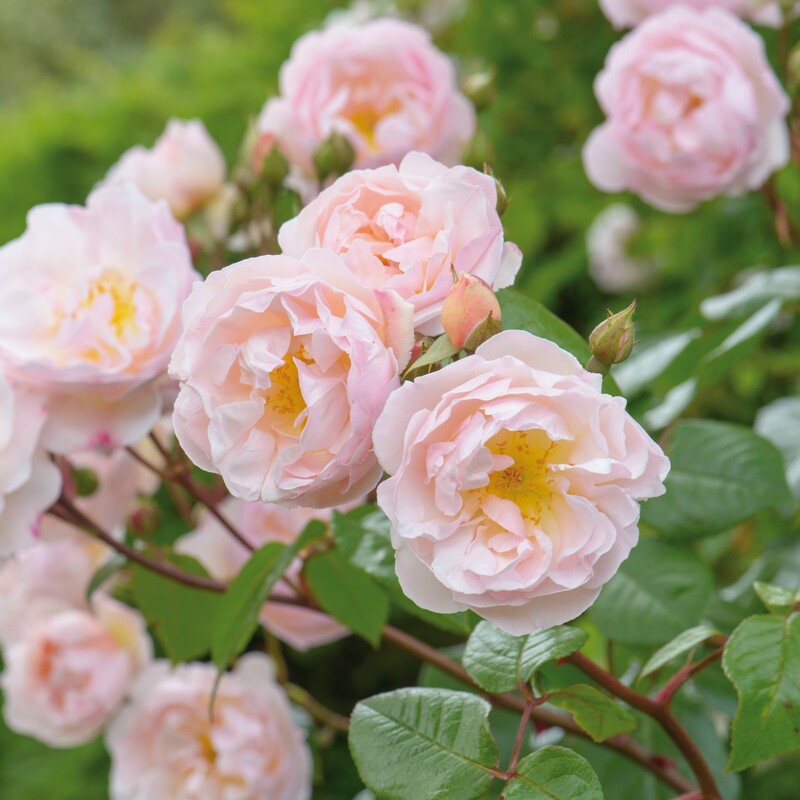 The perfect rosette flowers are shallowly cupped, about 3" across, and are a very pure light pink, the outer petals paling prettily towards the edges. 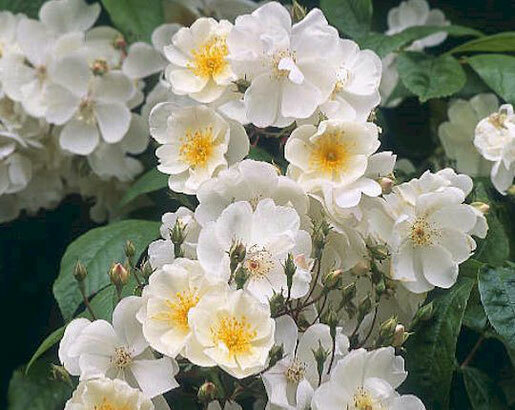 The growth is elegantly arching, producing its flowers along the stems and building up into a fine, vigorous shrub. 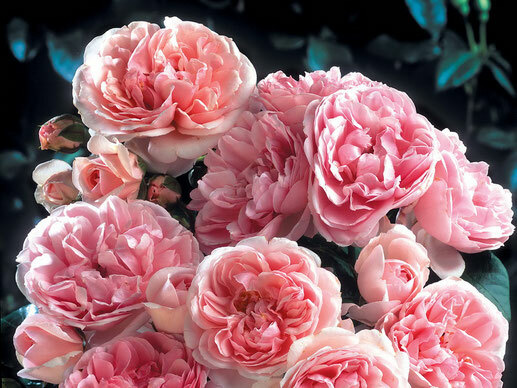 David Austin, 2008. 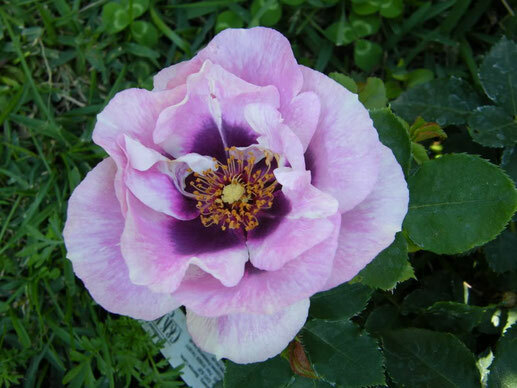 Eyes of you is a hybrid of Rosa Persica, one of the oldest species used to create new varieties, with purple flowers with a darker center reminiscent of peonies with a contrasting eye color. It was obtained by an English breeder in 2008 who continued and collected the work of Australian breeders who had already started in the seventies. Re-flowering, with long lasting flowers, compact, about 80 cm tall, it is also suitable for growing in pots. The English advise to put it on the entrance of the house to taste the perfume at each step. Leaves: they are numerous and create a thick and compact vegetation. They are are resistant to the most common diseases that affect the roses and show themselves healthy until the arrival of frost.